"All of the wind turbines, rooftop solar panels, hydroelectric and biogas plants in Germany have not reduced CO2 emissions in Europe by a single gram. On the contrary, they have helped lower the price of emissions allowances on the European carbon market -- much to the delight of Europe's dirtiest industries." "So, perhaps you've heard about Germany's heroic green revolution, about how it's overhauling its entire energy infrastructure to embrace renewable energy sources? Well, in reality, our chimney stacks are spewing out more than ever, and coal consumption jumped 8 percent in the first half of 2013. 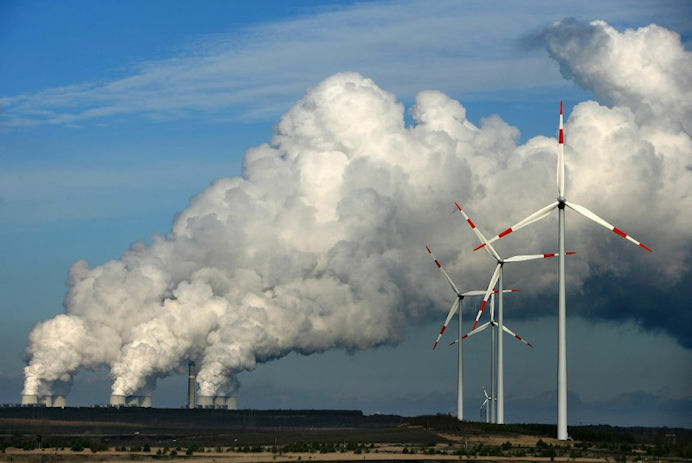 Germans are pumping more climate-killing CO2 into the air than they have in years." "Renewable energy and the coal boom are causally linked. The insane system to promote renewable energy sources ensures that, with each new rooftop solar panel and each additional wind turbine, more coal is automatically burned and more CO2 released into the atmosphere." "And let's not forget the bureaucracy monster: German bureaucrats have come up with over 4,000 different subsidy categories for renewable energy, apparently adhering to the principle that what is particularly expensive has to be lavishly subsidized. As a result, a large proportion of the subsidies are used to support highly inefficient technology, such as solar parks in regions of eastern Germany that receive relatively little sunlight and wind turbines far off Germany's North Sea coast." "The bureaucratic system also puts the brakes on innovation. Little research is conducted in areas in which no subsidies beckon. Technical progress is hobbled by the ploddingly predictable imagination of civil servants." "...if the Energiewende turns out to be a climate killer, it would be better to call the whole thing off." Our comments: and yes, wind farms are indeed "climate killers", as revealed by the data from this article (more CO2 released, not less). Germany pretends to be a pioneer in the green revolution. But its massively expensive Energiewende has done nothing to make the environment cleaner or encourage genuine efficiency. One writer argues: Either do it right, or don't do it at all. So, perhaps you've heard about Germany's heroic green revolution, about how it's overhauling its entire energy infrastructure to embrace renewable energy sources? Well, in reality, our chimney stacks are spewing out more than ever, and coal consumption jumped 8 percent in the first half of 2013. Germans are pumping more climate-killing CO2 into the air than they have in years. And people are surprised. Why coal, you might ask? Aren't Germans installing rooftop solar panels and wind turbines everywhere? What's being done with the billions of euros from the renewable energy surcharge, which is tacked onto Germans' power bills to subsidize green energy and due to rise again soon? 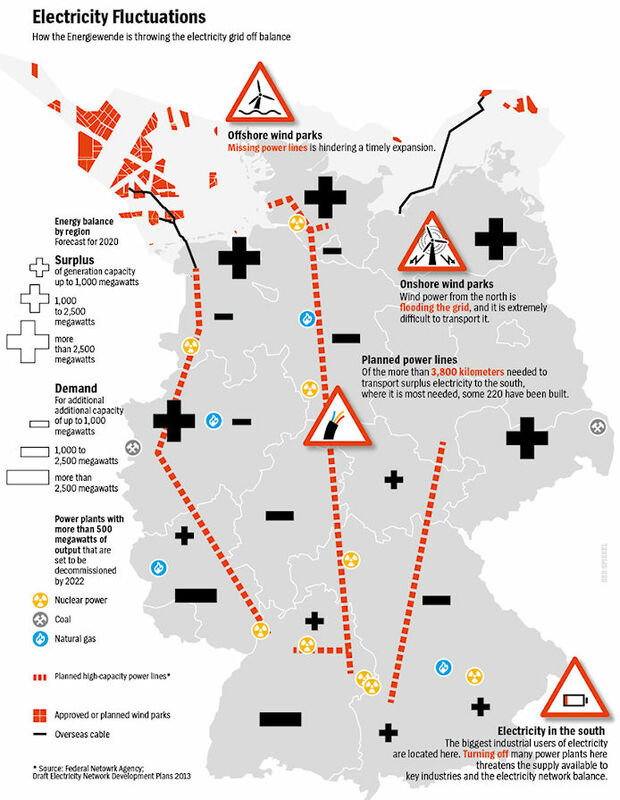 This is certainly not how we imagined the Energiewende, Germany's push to abandon nuclear energy and promote renewable sources, which Chancellor Angela Merkel's government launched in 2011 in the wake of the Fukushima disaster. This same government acts as if this coal fever were merely a growing pain or transitional problem. But that's not true. Instead, it stems from structural flaws in the Energiewende. Renewable energy and the coal boom are causally linked. The insane system to promote renewable energy sources ensures that, with each new rooftop solar panel and each additional wind turbine, more coal is automatically burned and more CO2 released into the atmosphere. Indeed, Merkel's Energiewende is morphing into an environment killer. It burdens the climate, accelerates the greenhouse effect and causes irreversible damage. Take the fluctuation/storage problem: Sun and wind sometimes provide an abundance of electricity, and then nothing at all -- depending on the time of day and the weather. When they are pumping out lots of power, however, very little of the surplus can be stored because there is a lack of appropriate technology and the incentives to develop it. German law stipulates that renewable energy always has priority in the grid. When gaps emerge in the electricity supply, though, they have to be bridged by conventional power plants. Unfortunately, these are usually not gas plants, but ones burning cheaper coal. As long as there are no storage facilities for green electricity, every wind turbine and every rooftop solar panel will cast a dark shadow. And then there is the brake on investments: The price of electricity at noon used to be particularly high due to the large demand. Today, it's often particularly low because large amounts of solar power are flowing into the grid. Subsidized and privileged solar electricity is forcing other power plants out of the market. Only cheap coal can compete on price. Nearly all plans for the construction of new, better and more efficient power plants have been shelved. Nobody invests in facilities that don't pay off. Instead, the energy companies are drawing as much electricity as possible from their power plants that are slated to be phased out. Likewise, there is the dilemma over the right to pollute: Germany's efforts to promote green energy are colliding with the European emissions trading system. Every kilowatt hour of renewable energy frees up emissions allowances. These allowances are regrettably not discarded, but are instead sold and used elsewhere to offset pollution by the Spanish cement industry, Polish lignite plants and German steel mills, for example. All of the wind turbines, rooftop solar panels, hydroelectric and biogas plants in Germany have not reduced CO2 emissions in Europe by a single gram. On the contrary, they have helped lower the price of emissions allowances on the European carbon market -- much to the delight of Europe's dirtiest industries. And let's not forget the bureaucracy monster: German bureaucrats have come up with over 4,000 different subsidy categories for renewable energy, apparently adhering to the principle that what is particularly expensive has to be lavishly subsidized. As a result, a large proportion of the subsidies are used to support highly inefficient technology, such as solar parks in regions of eastern Germany that receive relatively little sunlight and wind turbines far off Germany's North Sea coast. The bureaucratic system also puts the brakes on innovation. Little research is conducted in areas in which no subsidies beckon. Technical progress is hobbled by the ploddingly predictable imagination of civil servants. Unfortunately, the debate on the Energiewende revolves almost entirely around costs. Germany is about to get a new coalition government -- and one without the business-friendly Free Democrats. But the future government has to do much more than just continue to squabble over the financial details. It has to remedy the fundamental design flaws; and, if it doesn't, the Energiewende will lose its legitimacy. Granted, it's annoying that switching to renewable energies is driving up the price of electricity. But it can't be avoided. Still, if the Energiewende turns out to be a climate killer, it would be better to call the whole thing off.